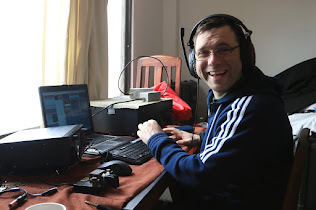 The 2014 series of 50MHz UKAC kicked off with an all time record entry of 155. The previous highest was 152 in April 2013 and in January 2013 there were 128 entrants. Unfortunately the conditions didn't match the entry level and were variously described as "poor", "desperate" and "the worst ever". Wet and windy weather meant a number of entrants had their masts lowered for safety and portable activity was somewhat reduced. Despite this there were 278 active stations in 21 UK squares and 2 non-UK squares. The conditions caused the multiplier totals to be very low with G3PYE/P (JO02) and M1MHZ (IO92) only working 15 squares. The best tropo contact was between GM4JR (IO85) and G3PYE/P (JO02) at 405kms. I managed to finish up in 3rd place from IO91 Square within the Restricted section out of a 100 entrants in this section all of us on 100 watts output, here is a list of the top 10 who finished in the restricted section. Here is a List of the Locators that were active within the contest. look forward to working you in the contest.